Tenere, Inc., Dresser, WI, manufactures advanced, custom components from metal and plastic for companies with highly demanding, fast-changing needs. Founded in 1966, the company operates three facilities in Wisconsin (Dresser, St. Croix Falls and Somerset) and two plants in Colorado (Lakewood and Westminster). Acquired in 2012 by the Watermill Group, Tenere last year purchased Protogenic, an experienced rapid-prototyping operation. Tenere installed the new operator interface on a flexible arm, allowing its press operator to position it—even vertically, to suit the operator’s height—most efficiently for the job being run. Tenere stamps and fabricates sheetmetal, and manufactures injection-molded and machined products. It also provides integration and system-level assembly services. Its strategy: to be a full-service supplier to original equipment manufacturers in the network-communications, enterprise-software, agriculture, medical and aerospace industries. Watermill acquired Tenere with a plan to see it grow significantly. The plan has proved effective, as it has experienced tremendous growth in all areas, including stamping. The firm’s stamping department quickly ramped up, by mid-2013, to three-shift operation and, with overtime, had tapped the local labor market nearly dry. More capacity was needed, and fast, as sales kept coming in. In addition to new press controls, TCR also recommended adding a sensor lab to Tenere’s operation and tasking one of the firm’s toolmakers to focus on in-die sensor applications to further optimize press productivity. 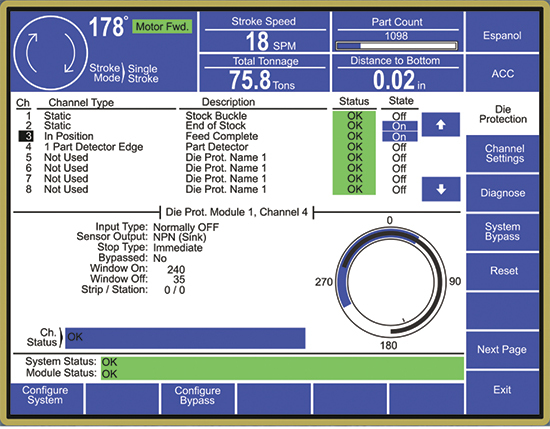 The control‘s user interface displays the window where the system watches for sensor input to turn on (in blue), and then fills in with black when the sensor actually is on. It greatly simplifies programming and setting of the proper angles. Tenere’s goal: to pursue a growth strategy that involves different layers of simultaneous investment, optimizing performance with its existing equipment and footprint while adding new equipment and facilities to extend capabilities and capacity. Incremental investments in controls and sensors help the firm drive performance and customer satisfaction. The first press selected for implementing the new controls was one of the busiest in a building full of busy presses. TCR installed a Link Systems’ 5100 AMC, (Automation Machine Control) to the press, with 16 channels of die protection, 16 programmable-limit switches, a high-end tonnage monitor and communication for the servo feeds in use. The Link process control mistake-proofs other parts of the production system, not just the tooling. For example, shown here is a sensor monitoring motion of the scrap system’s moving crossbar. In addition, discussions with Tenere’s production manager and maintenance manager revealed a need for more-efficient scrap removal and die lubrication. So, TCR added a Mayfran Shuffle Drive press-mounted scrap system to the project, and an Industrial Innovations’ spray system for die lubrication. In addition to using the more sophisticated die-protection capabilities of the process control to protect the tool, TCR used the Link control to develop a more integrated production system. The goal: mistake-proof other parts of the process beyond the tool itself. In addition to starting automatically, saving the operator’s time, the conveyors also stop automatically when the press has been idle for more than one minute. This saves energy and reduces maintenance costs caused by systems running needlessly. Before installing the new equipment, the press ran with two operators—one handling parts and the other watching for problems in the tooling. Die crashes occurred regularly, causing production delays and overtime for repairs and for production to catch up. Now, one operator mans the press to handle the parts, hourly production has doubled and we’ve not had a single crash. It has been a major success. 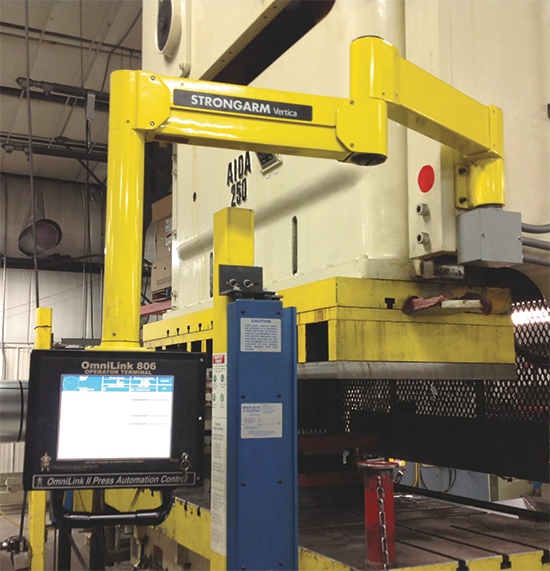 Fisk immediately approved the installation of the equipment on three more of the firm’s busiest presses. 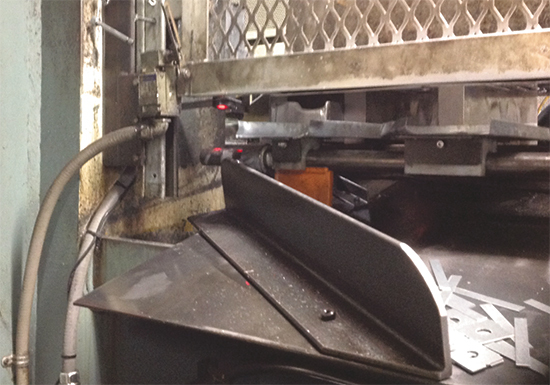 Article submitted by TCR Integrated Stamping Systems, Wisconsin Rapids, WI; 800/676-2240; www.tcr-inc.com.